Again a spectacular match full of goals in Marassi. Genoa took the lead by a header (!) of Belluschi in the first half after a perfect cross of Mesto. A few times we were close to the second goal, but Italian international Montolivo scored the equalizer after a mistake of Marco Rossi. Halfway the second half Fiorentina scored their second goal by a header of Natali out of a corner. As many times this season it was Rodrigo Palacio with his fifteenth (!) goal who saved us for a defeat in the 89th minute. Because also Lecce draw we still have an advantage of 7 points to the 18th position in the standings. Already in the third minute Osvaldo scored the only goal of the match. To be honest Roma deserved the 3 points unless the ball on the crossbar of Palacio 15 minutes before the end. It was the only time in the 2nd half that Genoa was close to the equalizer, while Roma was many times close to 2-0. Sunday we play in Luigi Feraris aginst Fiorentina that has 32 points, 1 less than us. After 10 seconds the openinggoal was very close when Rodrigo Palacio almost beat goalkeeper Buffon of Juventus with a fantastic shot. In the second half Juventus hit the crossbar and twice the post, but the scoreboard still was empty. In the last minutes Genoa probably deserved a penalty when Marco Rossi was fouled in the penaltyarea, but the referee gave us a corner. To be honest: Juventus mostly deserved the 3 points, so after all we can be happy with a draw, but 1-1 or 2-2 would be a more usual score for this spectacular match. Genoa now has 33 points in 27 matches. 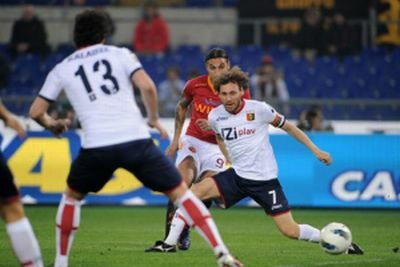 Next monday Genoa plays in the Olimpic Stadium of Rome at 20.45 hours. In this match we miss 6 players: the defenders Antonelli, Bovo and Granqvist and the midfieldplayers Constant, Kucka and Sculli. Maybe we now finally can see more of our technical midfieldplayers: Veloso, Belluschi and Jorquera. The last victory against A.S. Roma in the capital of Italy was in 1990, so it’s time to a new victory. Lecce-Genoa 2-2; 2x Sculli but in the 94th ..
Genoa returns home from the far South with a golden point, which means that the advantage on Lecce stays 7 points. At halftime Genoa leaded by 0-1, the goal was scored by Giuseppe Sculli after a fantastic combination with Palacio and Jankovic. In the 16th minute of the 2nd half Muriel scored the equalizer after he beat Marco Rossi in the run. After this goal it was time for the long distance free-kicks: Jankovic two times was close to a goal but Lecce goalkeeper Benacci saved his team. In the 80th minute it was Brivio who shot his free-kick behind Sebastien Frey: 2-1 to Lecce. 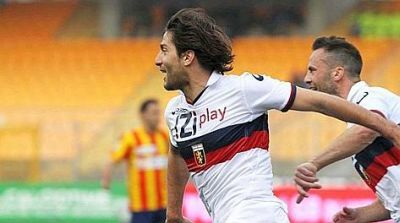 Genoa did not accept another away-defeat so the players of Pasquale Marino went forward. In the 86th minute the reward came. Referee Russo refused to give us a penalty, but the corner that followed was headed in by Sculli: 2-2. In the 94th and last minute 3 players of Genoa ran towards goalkeeper Benassi of Lecce, but Sculli’s shot was blocked by the goalkeeper. We could have won this match, but a draw is also a good result. Next week we try to beat Juventus for the first time this season. Probably with Alberto Gilardino back in the team and hopefully also with Andreas Granqvist who looked heavily injured today.